The North Carolina National Guard held a special ceremony on Friday honoring a fallen member and renaming the Benson Readiness Center. The center was named in honor of Sgt. 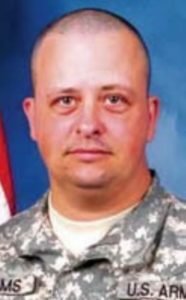 Roger Adams of Jacksonville, NC who was killed in Iraq in September of 2009. While assigned to Company A, 1-120th Combined Arms Battalion of the 30th Heavy Brigade Combat Team, Sgt. Adams and four others were killed when they received wounds from a nearby improvised explosive device detonated near their vehicle. 30th Armored Combat Team Commander Col. Robert Bumgardner and other dignitaries were on hand for the renaming of the Center located at 214 E. Mann Street. Sgt. Adams was the recipient of several distinguished military honors. He served in the United States Marine Corps for 13 years, then enlisted in the N.C. Army National Guard in March of 2006. A marksman with the M4 Carbine rifle, Sgt. Adams received a Purple Heart, Bronze Star, U.S. Army Meritorious Service Medal, U.S. Army Achievement Medal, North Carolina Meritorious Service Medal, Global War on Terrorism Expeditionary Medal, Iraqi Campaign Medal, National Defense Service Medal and he received the Combat Infantry Badge.